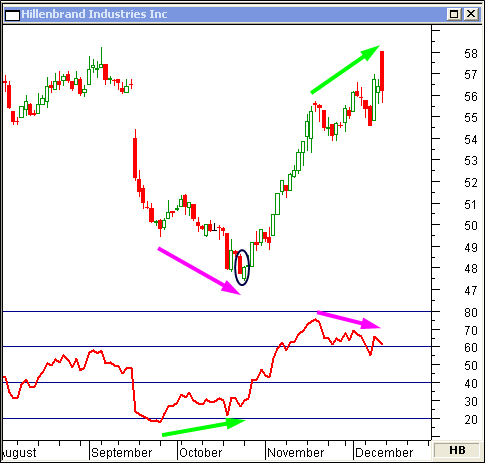 earish and Bullish Divergence between price and the relative strength index can forecast possible trend changes in a stock's movement. 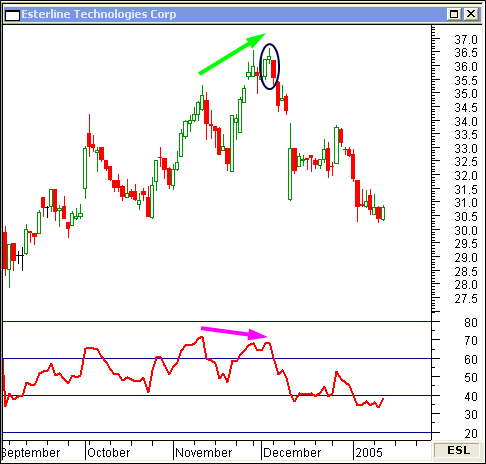 Learn how to identify these turning points by examining the following charts. 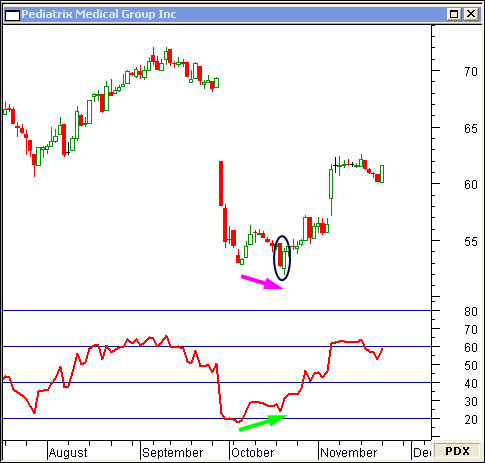 Bullish divergence coincides with an A-B-C corrective wave down on this daily chart of Oxford Industries Inc.
On this daily chart of Pediatrix Medical Group, RSI divergence and a piercing line candlestick pattern mark the end to the correction down. 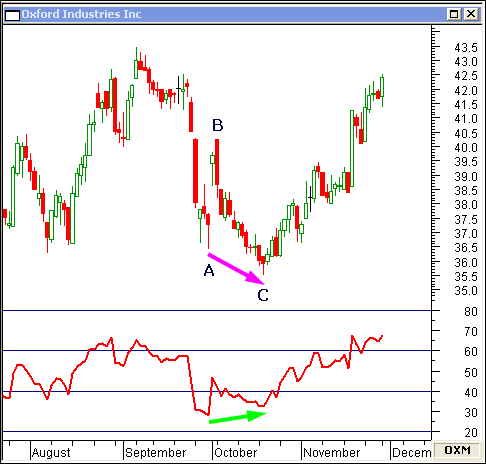 Bullish and bearish RSI divergence are marked on this daily chart of Hillenbrand Industries Inc. Note how the reversal days are obvious and decisive... with a piercing line candlestick pattern marking the bottom. Bearish Divergence is more common due to the volatile nature of stocks making new highs and then reversing, abruptly. 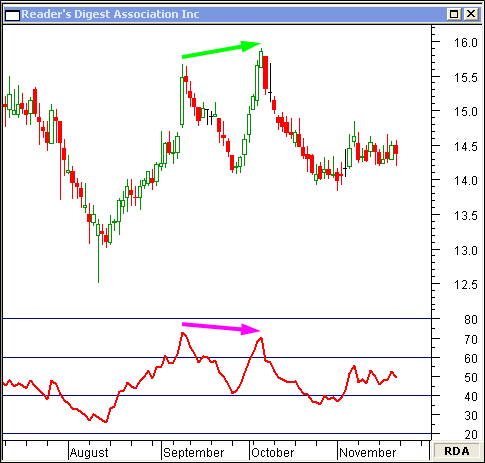 Reader's Digest Association shows bearish divergence and a possible double top on this daily chart. 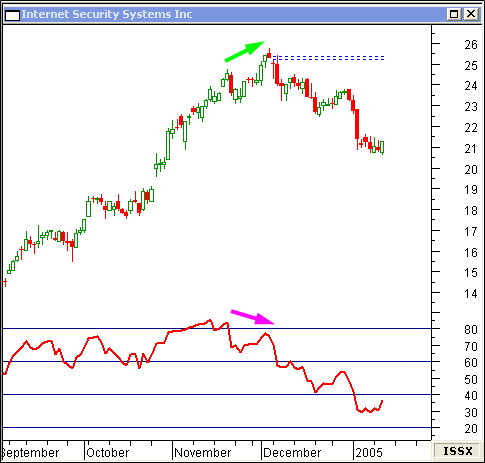 Bearish divergence and an evening star candlestick pattern mark the top on this daily chart of Esterline Technologies Corp.
Internet Security Systems Inc gaps down after bearish divergence between price and the RSI.